Another amazing paleo friendly recipe to keep us warm over these wonderful holidays. With Thanksgiving behind us and the air chilling around us, I love hearty, warming and easy recipes. 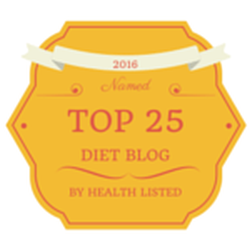 As a predominate celiac family, I need to adhere to gluten free in my home with the strictest of standards. Since I do better off all grains, I truly appreciate sharing recipes I can get behind. No matter the holiday celebration, be it Christmas, Hanukkah, Kwanza or what have you, I am sure you will enjoy a new delicious paleo recipe at your very own table. 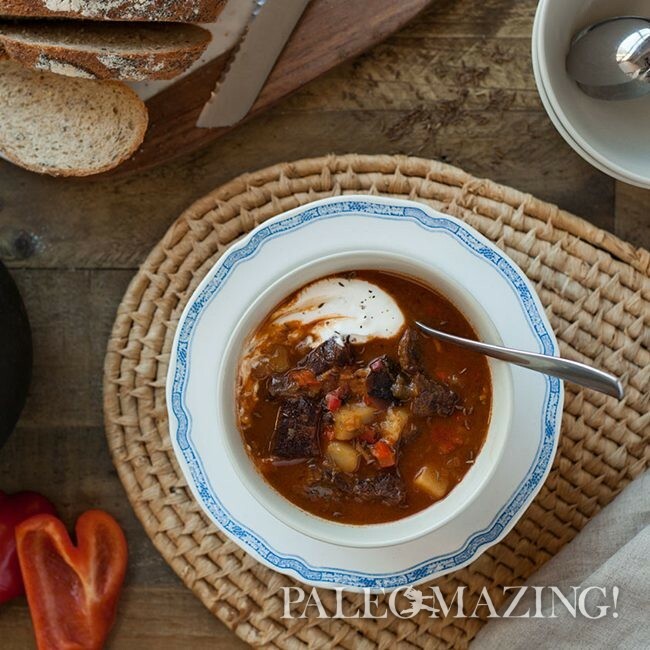 So lets warm up winter with a grass fed beef goulash. I am really getting pretty addicted to this amazing company, PRE, with their grass fed and grass finished beef. It is loaded with good fats and more Omega-3’s and CLA’s than commodity beef, without any added hormones or added antibiotics. And lucky us, we can purchase PRE at Amazon Fresh or a retailer near you. 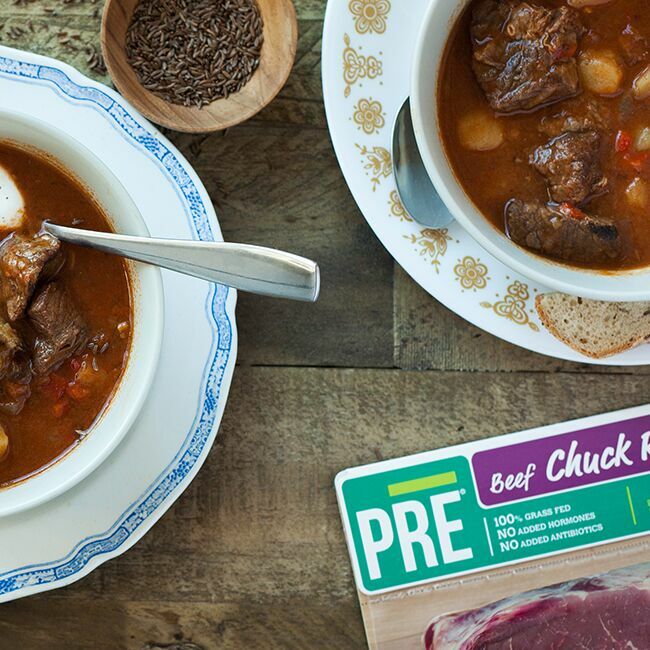 This iconic Central European dish of stewed meat with vegetables, gets an upgraded kick with PRE Brands chuck roast and a clean ingredients list. I hope you enjoy it. This would be a great holiday meal or anytime meal. Winter is here! Enjoy more PRE Brand recipes here on my site. This iconic Central European dish of stewed meat with vegetables, gets an upgraded kick with PRE Brands chuck roast and a clean ingredients list. I hope you enjoy it. This would be a great holiday meal or anytime meal, winter is here! Heat coconut oil in bottom. Cook bacon slices in oil until crisp. Set aside. In same oil, brown chuck roast pieces until deep color appears on each side. Set aside. In the same fat, sauté onions and garlic until caramelized. Add paprika, caraway seeds, and flour to make a paste, about 1 minute. Whisk in vinegar and tomato paste for about 1 minute. It should be thick. Stir in broth, salt, bell peppers, bacon, red pepper, potatoes, and chuck roast. Cover with lid, set the valve to ‘Sealing’, set Instant Pot to manual for 45 minutes. Taste and adjust with salt. Serve warm with paleo bread, and freshly cracked black pepper. If you don't have an instant pot, make this recipe in a slow cooker. Set it to "low heat" for 8-10 hours.